A noted economist accused of trying to look up a high school student’s skirt in April reiterated his innocence Monday in his first appearance before the media since the alleged incident occurred. 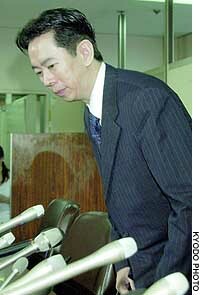 Speaking at a news conference at the building housing the Tokyo District Court, Kazuhide Uekusa, 43, swore “by the gods of heaven and Earth” that he is not guilty. 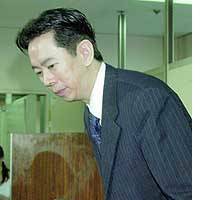 “I am putting my life on the line to fight this false accusation,” the former Waseda University professor said. Uekusa was arrested on suspicion of using a small hand mirror to try to look up the girl’s skirt on an escalator at JR Shinagawa Station in Tokyo on April 8. He initially owned up to the misdeed but later denied it. He pleaded innocent in June. On Monday, Uekusa maintained that his first admission was made at the strong suggestion by police that he would find leniency if he owned up. “I was also in a confused state, and so I acknowledged (the contents) of the statement taken,” he said. He also criticized the media, saying one-sided reports cast the strong impression that he is a criminal. The scholar also explained that he carried a hand mirror with him to check his clothing, because he often makes television appearances.